We all know that Skype is very popular and is used by millions of people all over the world. 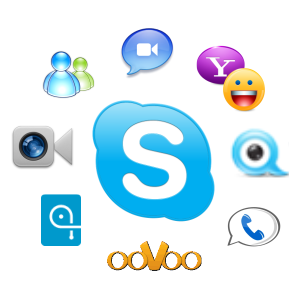 But keep in mind that Skype has many alternatives – programs that can be used for internet chat, video and audio calls. In this article we’ll take a look at 8 of these Skype alternatives. Note that the information in this article may already be outdated if the companies have changed their services. For most recent information, check in their websites. ooVoo – Except the standard audio calls, the program allows video calls with up to 6 users. The free calls anyway, are with only 1 person at the same time. You can import contacts from email accounts and from several social network sites. Audio and video call recording (paid), file sending (free for up to 5MB) and text messaging are some of the other features in ooVoo. You can even use the online version (free) if you do not want to install ooVoo on your computer. TinyChat – This Skype alternative does not even need an installation. It is basically a website, in which you can register and create chat rooms or join already existing ones. You can make audio and video calls too. You can make conference calls with up to 12 people and the way I get it, it is all free. iChat – The program is part from the Skype alternatives for Mac and it comes as part from the operating system Mac OS X. It offers chat, video calls with up to 3 users and audio calls with up to 9 users. iChat works with MobileMe and AIM. Other features are: file sending, SMS forwarding, incognito mode, loading more than one account at the same time and others. Windows Live Messenger – It also offers chat, audio and video calls, but except that we have HD video calls. The program can be used only by Windows Vista and Windows 7 users. For now there is no option to call landlines. Google Voice – This is a service by Google, that offers free calls in USA and Canada. At least from Google promise that this will be true until the end of the year 2011. An unique feature is the ability to transform audio calls into text messages. Also you can set the program in a way that when you get a call, your home or office telephone rings, depending on who is calling. International calls are paid, but pretty cheap. There are other features too, like: conference calling, SMS to Email, call blocking and others. TokBox – This is another web based application, that does no require installation. Just register in the website and that is it. You can make video calls with up to 20 people in the same time and for free. There are also paid subscriptions for even larger video conferences. You can also import your contacts from Gmail, Yahoo, FaceBook and others. Another interesting feature is the sharing of YouTube videos inside the interface of the program. A downside of TokBox is that the video calls are with not that high quality. FaceTime – This is another Skype alternative from Apple. FaceTime is made for Mac computers and for iPhone 4 and iPod. It allows video calls on full screen and with a picture within the picture (so you can see yourself while you are talking). Of course there are many others Skype alternatives, but I think that these 8 are some of the most popular and will be enough if by any chance you decide to abandon our favorite Skype ;). Hi. Haven’t heard for this problem. Is there anything else that the error is saying? And is it on a blank white page or it is inside the website blue interface? Could you try from another browser? QQ is the best messenger imo. Custom backgrounds, custom emotes (like ANYTHING and any gif), virtual storage (store up to 256mb of any files in there, retrieve anywhere you log in! ), webcam fx in chat, offline msgs, edit chat history, and the Screen Grab (Ctrl Alt A) can take a pic (or GIF!) of any part of the screen (you choose dimensions) while revealing RGB/Hex, and lets you add filter fx for an instant artsy shot! The instant-screen grabber thing alone makes QQ light-years ahead of any other messenger. WebEx, Gotomeeting, RHUB, GoMeetNow etc. are other few alternatives to Skype. Curse Voice is a great alternative for gamers!